On the Addendum XXXI & XXXII discussion at the NYS DEC Bunker at 6:30 this evening, also as I was told it will be essentially a "protocol meeting" at most. Now I would imagine your next question will be "why" and it boils down to the fact that the MAFMC is still waiting for usable data from the stock assessments - which should have been made available by the science side for guidance and use by the regulatory side of fishery management at this time of the year. Thus this is why we are now hearing something akin to a "status quo pause" at this point as we are approaching 2019. It now appears that there is the continued major issue with merging the new re-calibration without the new stock assessments, as there is more questioning by those on the Monitoring Committee on the growing inaccuracy of MRIP estimates, which was supposed to be lessened with the re-calibration! Oh yes with the proverbial "dog chasing its own tail" and solving nothing once again, as just maybe they are finally coming to grips with the fact that there are more biscuits, fluke and silver around then the past estimates have reported (and maybe agreeing that we are keeping that many less fish too at the same time). For those over at MRIP who somehow cannot punch their way out of a wet paper bag in convincing anyone that their estimates have some modicum of accuracy, they always will fall back when asked on this very question by using the infamous line of "it's the best available!" To think that the primary reason MRFFS and MRIP are used as a fishing counting tool was to show harvest trends "at best" since they within various levels of fishery management continue to realize that it is extremely hard to reasonably quantify what the private and shore bound modes are catching. To think that with all the academic contortions and manipulations in massaging the way they estimate catch and more so harvest, they still keep finding that even within a single Wave for a state, they still have such great imprecision (PSE 50 and greater) on whether private vessels harvest closer to 10,000 fish instead of 100,000 fish as we see within the tables when queries are done with BSB. NOTE: Look at the MRIP data query below on BSB for Mid-Atlantic States, and first pay attention to all the red shaded PSE boxes. Also can anyone explain how NY with a 3 fish possession somehow caught double the amount of BSB (at 15 inches minimum size then the NJ @ 2 fish possession (at 12.5 inches) especially with the slow start in NY due to coming off another cooler than normal spring and early summer once again? So what else is new other than the concept of using regional management, which on paper seems to be a good concept, is in reality - unworkable for those states within the region? Somehow it seems that you just may have to allow the states to use conservation equivalency in dealing with literally what they have to work with in accessing the productivity of the local fisheries as we see clearly see the differences in what fishermen catch in one part of the state, to the other. Both the states of New Jersey and New York have a noticeable difference in the average size (as well as to quantity of keepers or is that 'keptors') of the fluke and BSB on each end of their respective state. Who can deny this fact with what we see in the fishing reports and pictures we see these days? There is no doubt that the spring and fall migratory pattern have noticeably changed over the past decade with the traditional fishing calendar not being as reliable as it once was. One interesting point made to me this morning by a noted party boat captain home ported in the once Empire State is in having New England haddock now found within areas where southern pinfish are being harvested. Who would of thought such a anomaly would occur off the south shore for us fishermen here on Fantasy Island especially with the commercial catches of haddock being made right off the very shores of this state? So as I wrap this up on what to not expect this evening, please do attend tonight's meeting at the Bunker. It is always good to see old fishing friends, but as much to possibly hear it directly from those on the other side of the regulatory table. I should toss this out from news I heard last night, and which I talked with/over someone this morning, and that is over the NYS FFL reports from fishery consultant George LaPointe. It now seems and contrary to what was stated at the MRAC meeting a few weeks ago, the report will be DELAYED for being released this week, or as was reported as being available near or at the end of November. As I was told, Mr. LaPointe is still doing his due diligence with his summaries and recommendations, and that it could be delayed as long as until early January. Is this good or bad news for those who hold a NYS FFL, and I cannot make heads or tails at this point without more verified information, but I do surmise that there may be some "legal hurdles" that may have to be addressed and thus resulting in the delay. Of course this would most likely lead to further delays in state legislative changes in 2019 as Director Gilmore alluded to about the outcome from the Mr. LaPointe and his report, as this will now have to then be discussed and publicly commented at upcoming MRAC meetings. Finally as I was also reminded this morning, the January MRAC meeting should be attended by those in the NY fishing industry as well as fishermen to directly hear the news on what to expect in the 2019 fishing season. 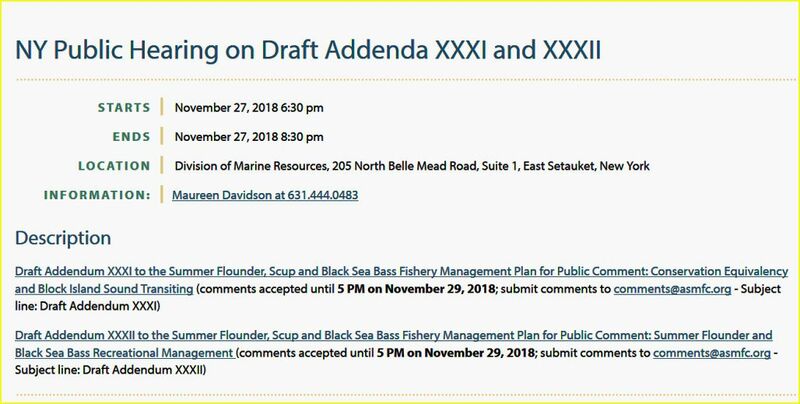 This of course is nothing new about this first state meeting as fishery management continues to spiral down an ever convoluted path of making little sense for even those who have some grounding in the process. Do NY fishermen continue to choose and follow the fluke and BSB regulations we had in 2018 for 2019? How well did that work out with the current size and bag limits as well as season length for these two fisheries? We should have some preliminary news hopefully being available within the coming days.